Finally! 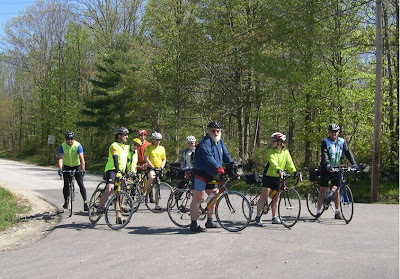 We had superb weather for the KVBC ride last Sunday in Vassalboro, and a great ride on top of that. Thanks to John Schooley for laying out the route and leading the ride, and thanks to the seven or so riders who came and made it a great day. This weekend will be filled with more great cycling: Saturday is the reknowned "Lobster Ride" in Rockland, sponsored by the Bicycle Coalition of Maine. Sunday will see the return of a classic KVBC ride from Gardiner to Bowdoinham led by Joe Renda. The weather forecast for the weekend looks great! See you then! "Biking to Bowdoinham" - a tour of the southern Kennebec Valley through Gardiner, Richmond and Bowdoinham. START: 10:00 AM, at the Laura Richards School, Rt. 201 in Gardiner, 1.5 miles south of the junction of Rt. 201 and Rt.s 126/9 (the junction near the A-1 Diner). The school is a new brick building with a "spiked ball" sculpture, on the west side of Rt. 201, on the left past the Gardiner Armory (just as you enter the "thickly settled" area). Park in the lot on the north side of the school. HIGHLIGHTS: quiet back roads along streams and farmland south & west of Gardiner.